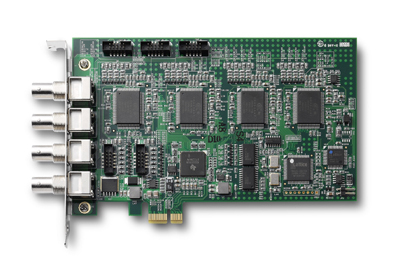 The PCIe-RTV24 acquisition board is designed without compromise for machine vision and video surveillance applications. It is the ideal device for PC-based multiple-channel vision application. 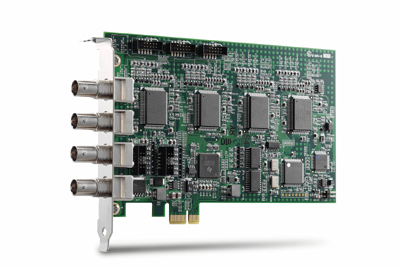 The PCIe-RTV24 PCI ExpressR x1 lane frame grabber can capture simultaneously four analog video streams in real time. It accepts standard composite colors (PAL, NTSC) or monochrome video formats (CCIR, EIA). The supported resolution is programmable and includes square-pixel (640 x 480 or 768 x 576) and broadcast resolution. Before captured images are transferred to the PC's memory, images can be scaled down using available selectable ratios. Arbitrary cropping to regions of interest is possible. 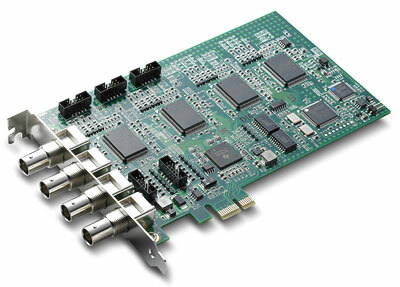 The PCIe-RTV24 generates bitmaps in all popular color formats such as RGB, YUV, planar, or packed. System integrators also benefit from a watchdog for fault-tolerant applications and easy-to-use standard connectors. The PCIe-RTV24 provides four digitizer vision stream for real-time image acquisition, acquisition speed up to 30 fps per channel. The output format of RTV series are RBG24/RGB16, and Y8, these are popular color formats in machine vision, and surveillance, besides the image function, the PCIe-RTV24 also provides 4-channel digital inputs/outputs, and watch dog function, these I/O can be used for strobe light control, trigger acquisition or report alarm signals. The operation system support is available for Microsoft WindowsR XP, WindowsR Vista (64/32-bit), and Linux, the software support of RTV series are MicrosoftR DirectX, Video for Linux, and VIs for NIR Labview. ADLINK's Angelo-LVIEW interface software packages contain libraries with many virtual instruments (VIs) acting as the interface between ADLINK DLLs and LabVIEW. Developers familiar with LabVIEW can easily take advantage of LabVIEW's intuitive graphical programming capability as well as the performance of ADLINK's frame grabbers. * National Instruments and LabVIEW are trademarks of National Instrument, Inc.